Ah, June…. ’tis one of the most pleasant months of the year in the Rocky Mountains. The spring storms have usually dissipated and the monsoons of the summer months have yet to begin their annual deluge. In the high country, travel is still difficult as the snows cling late to the lofty peaks. Therefore I have opted to make a short backpacking excursion to the mid-elevation forests and parks, where the grass is green and the early flowers fill the air with fragrance that upon inhalation awakens the olfactory nerves similar to what would occur should you enter into a candy shop. This particular Spanish Creek is located on the far side of the Great Divide from Gunnison, and is one of the headwaters for the Rio Grande coming off of Lujan Pass within the Cochetopa Hills. Already the rain shadow is in affect as the grass grows sparser than what would be found on the western slope an equal elevation. Despite my own assurances to myself that this would consequently be a dry hike it is raining upon my arrival to the trailhead. It appears to be localized and will most likely cease soon, as the rain-laden clouds don’t generally pause but rather move on swiftly to deliver their cargo elsewhere. To be sure, the Spanish Creek area is hardly wilderness although it is quieter than many areas with that moniker. There are roads crossing the open parks, going up gullies and gulches and through the forest. Cattle graze here in the summertime and the concomitant barbed-wire fencing is omnipresent. There are signs of past logging activity as the remains of ghostly trees are lying grey on the ground. The question must be asked: Why hike in such an abused ecosystem when there are opportunities to scope relatively untrammeled lands nearby? I suppose the answer lies in that this is still a relatively unscathed view-shed and excepting hunting season not many people come out here. There is peace here, if one can accept the alterations upon the landscape. The hills undulate off into the distance as the water flows out to and debouches in the upper part of the San Luis Valley. From past visits, I recollect that some of the geology appears to be volcanic in origin and consist of vast basaltic flows. 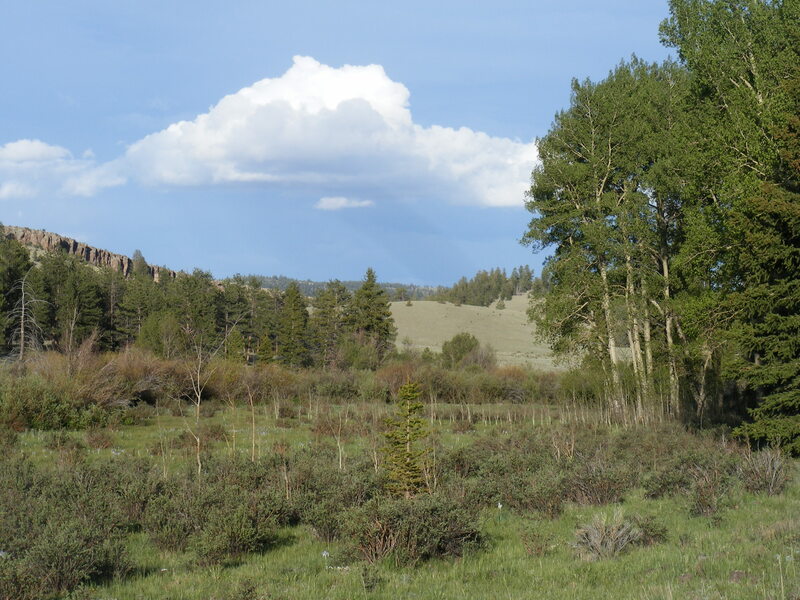 The circumference of this large park is ringed by the Great Divide, and the the upper elevations are thick with forest. But I shall camp at a lower elevation, where the forest is more park-like and open meadows abound. The hike is relatively short, only about three miles to my anticipated campsite. As I mentioned, the day was rainy. I park the car just off S.H. 114 and the “trailhead” in this case just happens to be here, where I start walking. Topographically, I am in the East Pass Creek Drainage, main stem of which flows down from North Pass along the same state highway that I followed to get here. I begin hiking along Forest Service Road 810 up a minor affluence. There are low cliffs on either side and the canyon I am in had a breadth of about 300 feet. This continues for a mile or so. Leah and Draco are with me, ignoring the rain and more interested in the small creatures that entice them with squeaky noises and swift, abrupt movement. I, on the other hand, am much more cat like when it comes to rain and wish for it to end. It is a soft rain, and I take no real precautions against moisture, a gamble to be sure, but I as I had suspected when I set out the rain soon moves on. As it turns out I exit the small, shallow canyon at the same moment that the clouds lift and I behold a vast park, about a mile wide by two miles deep. I have been here before and know my destination, a low set of hills on the far side of this park that form the physical divide between East Pass and Spanish Creeks. These hills contrast geologically with the basalt flows found nearby and are decomposed granite. They form ramparts that look like an old castle, and from previous expeditions to the area I have found parapets that afford a fine view of the surrounding country. I set up camp down along Spanish Creek but will take my meals up there, where I can let my mind wander over and digest the topography. Camp is set up quick and I make sure that all is sealed against further rain although I don’t believe it will precipitate again. I make ready for a exploration of the upper parts of the watershed and note with contentment that despite certain abuses there is still much nature to enjoy. About a mile downstream lies Sheep Creek of which Spanish Creek is the subsidiary. I venture the other direction, upstream along FS 810 which soon crosses a divide and lands in Bear Creek, a small tributary located between the aforementioned creeks. The forest cover grows denser and the aspen begin to grow in thicker groves as I slowly increase elevation. I cross over another divide and pass into Sheep Creek itself. Here, the road ends at long last. The road ends at a locked gate but the road grade continues. The Forest Service has thankfully closed off this road to further motorized use beyond this point. I keep walking till I come to confluence of the west and east forks of Sheep Creek. Making my way to East Sheep Creek, I spy an aspen grove pleasing to the eye. The clouds have since thinned a bit and the day has turned hot. In the grove is a large log which invites quietude and peace. I make my way over and sit, the dogs are happy to rest in the shade and the slight breeze reminds me why the aspen are called “quakies”. From the map I have chosen to explore this location because I am unsure about the actuality of the trails that emanate from this junction of the forks. Later in the month I plan to pass through this way, but from past experiences have learned that not all trails on the map are actually on the ground. So, this is part nature hike and part scouting mission to ascertain the veracity of the trails’ existence. They are there although rather vague not marked as such with signage, but I am satisfied that I will be able to make use of them. Now that I have found what I was looking for, I can enjoy a rest in the grove. Alas, I am wearing new shoes and begin to feel the onset of blisters in both of my pinkie toes. This surprises me because my past experiences with these shoes (I buy about a pair a year) is that they don’t produce blisters. Well, I suppose then that I needed to break them in and I curse myself for not wearing my old, familiar pair, despite their shoddy state. This road grade continues contrary to what is on my map and my curiosity as to its disposition is such that I resolve to follow it another half a mile, regardless of my blisters. The grade turns back on itself at the forks and climbs the opposite slope of Sheep Creek from that which it followed upstream. So, now the road is headed back downstream yet climbing in elevation. I meander along and decide that I have gone far enough after about ten minutes. I return to the locked gate, past the peaceful grove and the forks of Sheep Creek. I take another route back to camp, following FS 999. This particular road meanders along Bear Creek before finding it terminus at FS 810 and Spanish Creek. The woods open up again and I find myself walking along sparse grass although there are numerous flowers in bloom. The clouds are still above, but thin and not precipitating. However, it is bright and warm. Leah and Draco enjoy splashing about in the creeks, keeping cool and quenched. We arrive back in camp and my blisters are now fully formed. They are painful and I seek remediation before heading up to the rampart for dinner. As usual, I make Tom’s Stew, that particular concoction of ramen noodles, Vienna sausages and canned corn. From my perch, I can espy the entire park that lies below as well as vast distances that culminate in the far-off outline of the crest of the Sangre de Cristo Range. I used to live on the far side of that range, and I can mentally picture how I would get there from here. My mind soars out of my body and over the terrain between here and there; I can picture the general route and in some cases with specific clarity what I would find along that route. I stand for some time, my gaze in rapture at the far expanse. Soon enough, the sun begins to set bringing another day to a close. I make my way down to camp. I have wisely chosen to make camp some distance from my “kitchen” so that no bear will find its way to my food and then to me. Anytime people backpack in bear country it is wise to pitch the tents away from the area where food is prepared and consumed. There is no food in my tent nor anywhere nearby. I do have two German shepherds with me, which is fairly good bear-proofing, but I believe in keeping a clean camp regardless. The night comes on cold. Even though it is June, and the days are warm, the nights are cold. The moon is in the sky, shining bright midway through its second quarter. I indulge the shepherds and allow them into the tent to keep them from getting too cold especially since it is still damp and humid from the day’s earlier rain. I don’t care for the dogs in the tent generally since their claws can easily tear through material and they track in all sorts of filth, but I know that Draco in particular is too short coated to spend the night out comfortably. Besides, dogs make great heaters! Ah, spring…. and flowers. Just don’t eat these. Old slash from former logging operations in the area. There are large ponderosa here. I can only document, within my own mind, four times previously that I had been on horseback and I can say without shame that a horseman I am not. So, with a bit of trepidation, I accepted an invitation from close friends here in Gunnison to go astride one of their mules for a bit of trail riding. I have to say that it was one of my better efforts at establishing a rapport with a member of the equine family. Most of positive result of this adventure is do directly to my friends’ teaching ability. Both have worked as professional guides and are used to giving greenhorns concise and precise instructions in the art of mountain ways. The trek was an easy one as was the pace of travel. The day started with a late breakfast out, filling with both victuals and conversation. We then made the horses ready, currying till satisfactorily eradicated of potential saddle-sore causing material. The next step was ladening the trailer with the four hooved trail-masters. The real difficulty was in finding a place to turn truck and trailer around on the narrow Forest Service road, a situation that caused momentary anxiety. After that situation was smoothed over, we removed the four steeds and prepared to mount up. For me, there was more instruction and observance. Soon enough four were on the trail making way past Needle Rock, which looks vaguely like a basaltic outcropping, although in reality I don’t know. I like to speculate that perhaps this is the part of the eastern most extent of the lava disgorged from the West Elk Volcanoes some millions of years ago. I was in some ways fortunate to learn some lessons on equine communication at the nascent stage of our ride. I made some rookie moves regarding conflicting signals and directions which once solved made the vast remainder of the ride joyful. My mule was a joy to ride; it helped that her background was gaited so that I found picking up her rhythm to be natural and instinctive. Some years ago I picked up a phrase from a source I can not now remember nor document, but it related to working with German shepherd dogs, two of which posses me. The phrase went thus: Firm but Gentle. I found communicating with the mule to be similar. Make my intentions known and direct in a consistent manner. Canines and Equines are leagues apart in their outlook, one being predator and the other prey, but both respond positively to a steady hand. We rode at a slow pace, although I believe for only the equines it was slow. If I was on foot I most likely would have been lagging behind. We went past Needle Creek Reservoir and up the main fork until it met the divide with Razor Creek. Up and over we went and down into Razor Creek Park, a half mile by mile wide open, grassy expanse dotted with groves of aspen on the fringes. The slopes are sagebrush encrusted at the lower extremities and the higher slopes are thick forest of fir or lodgepole, depending on the aspect. Here we stopped at the high boundary of the park to partake in a respite from riding and to enjoy our packed meal. The horses and mules took the opportunity to sample the local grass and found it to their liking. We continued through the park for another mile or so before it was time to return. Since this was an out and back ride, the equines were a bit more willing to return, knowing that fresh hay awaited. Nonetheless, all were well mannered and the ride back was just as trouble-free as the ride out. I was sore just as if I had been hiking but in different places. I had a marvelous time of the ride and enjoyed being on mule-back. My only real fear is that if I rode extensively, what with my short limbs, my legs would become splayed out and with my waist I would form an inverted “U”! I left Logan fairly early in the morning as my friends had a busy day ahead of them and I was ready to get back home after more than a week on the road. I made my way out of Logan on U.S. 89-91 to Interstate 84 which I followed to its end at Interstate 80. I followed the latter interstate westbound, against my general direction, so I could get to S.H. 32 and thence to U.S. 40. Besides travelling through country I am not familiar with and was thus new and fresh to me, I was able to satisfactorily avoid the traffic and jumble that is now Salt Lake City by this round about method. I entered Colorado just west of the Town of Dinosaur on U.S. 40. 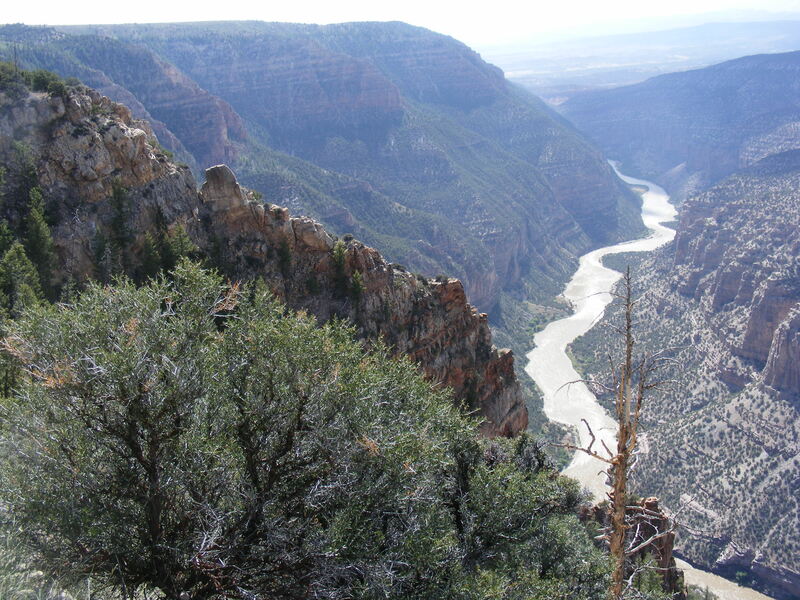 I had been advised to stop and visit Harper’s Corner within Dinosaur National Monument. So I drove up the long access road and was happily surprised to find fields of wildflowers in bloom. Most of the grass had turned green, and to my further surprise I found groves of aspen on the north side of Stuntz Ridge. Of course, this area is renown for its geology and it lived up to its billing. From the Escalante Overlook is a great view of upturned sedimentary strata. Overall, the road gives a great overview of the canyon systems and the surrounding geology of the Colorado Plateau. For a great overview of the geology of the area I recommend Roadside Geology of Colorado, 2nd Ed. Chronic and Williams (2002). I took a short mile plus hike at the end of the road that led out to a high precipice overlooking the confluence of the Yampa and Green Rivers. Those who fought to keep this area dam free when the Bureau of Reclamation sought to still these waters in the 1950’s did us all a great service. The waters continue to run free and strong, and we, the American public, are allowed our wild heritage. This is another area well worth further exploration, what with its fascinating geology and various climates. As it turned out, this was my last stop of my Western Road Trip. From Dinosaur, I made a rapid trip back to Gunnison, happy to sleep in my own bed and put the car to rest. It had been a great trip overall, with plenty of great memories of people and places, revisiting places visited before and finding new trails to explore. The weather had been great, possibly excepting the strong west wind that created a strong headwind when I was traveling westbound. I don’t know when I’ll be able to manage another trip like this one, but it most likely be until 2015 at the earliest. For now, these memories will do well. The birds began to chirp, and the morning star was shining bright in the eastern sky. It was time to get up and begin the day’s long drive across Interstate 80 through Nevada. I have been trying to take my time when passing through the state to see what sites there are, but today I wanted to get to Logan, Utah to visit friends. So, I got up and packed by starlight. The previous night I had chosen the campsite closest to the entrance of the campground so I would minimize the disturbance to the other campers when I left early. For the record, my clock said it was 4:53 A.M. when I left. I went back out to S.H. 4, which at this point was narrow without a center line, the same style of highway I had seen on S.H. 36 a few days past. There were numerous warning signs along the way restricting the use of the road by large vehicles and something about a 24% grade. As I turned east, the dawn was brimming with those hues that so graciously announce a morning in the mountains. 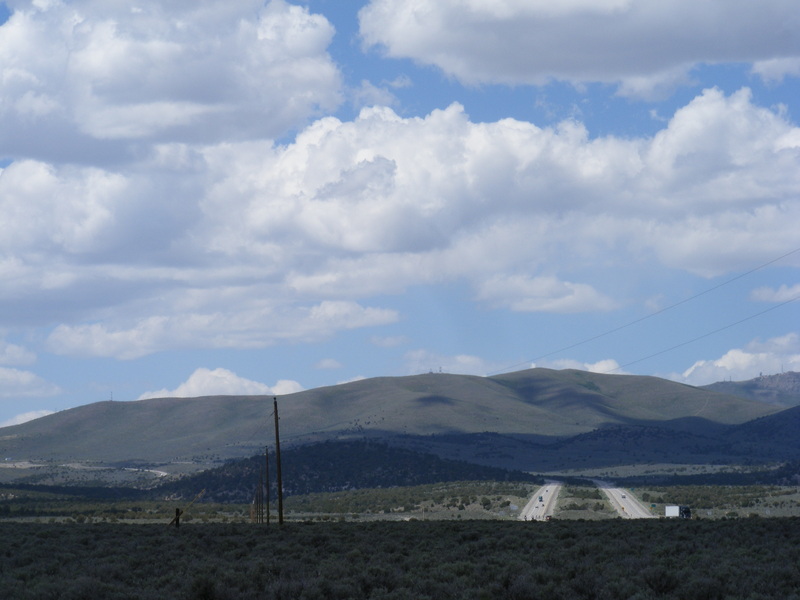 I drove a short ways and stopped at Ebbetts Pass; behind me to the west was the California of my youth and ahead of me to the east was the Great Basin and the Interior West. I savored the moment, that feeling of freedom and whimsy that overcomes me whenever I am perched on such a divide. I drove down to the eastern base of the pass and turned east on S.H. 89 to cross up and over Monitor Pass which would then take me to U.S. 395. The views were grand and I must again remind myself to visit and explore the region in earnest. I turned north on U.S. 395 and crossed into Nevada at Topaz Lake and shortly thereafter took Nevada S.H. 208 to Yerrington. The terrain was slowly changing from the mountainous to the dry lands of the desert. At Yerrington I turned right on U.S. 95A to its terminus with U.S. 95. I drove north on U.S. 95 and it was somewhere in here that I realized I had made the transition into full-on desert. East of Wells I left the fast-paced buzz of the interstate and its endless flow of traffic. This new road was S.H. 233 and narrow and lightly trafficked it was. I passed by more desert flats and barren ridges and crossed into Utah where the highway number was arbitrarily changed to 30. The desert continued until I made a long, sweeping miles-long turn to the north and dead-ahead lay a small mountain range, unnamed in the Rand-McNally Road Atlas, but nonetheless not an illusion. The highway gained elevation and stretched out for miles until we were up on a high plateau above the surrounding desert. The highway turned again, back towards the east and before too long we had reached another interstate. Interstate 84 eastbound to Interstate 15 northbound and then exit at S.H. 30 and follow that road all the way to Logan. What a day! Interstate 84 was posted at 80 miles per hour and people moved along at a fairly good clip. I wonder that Interstate 70 in eastern Utah isn’t posted at 80, but rather the more conservative 75. Once I had arrived in Logan I stopped to call my buddy but didn’t get through so I went to a large park to find a place to rest and sit in some shade. At that moment he called and oddly and serendipitously enough he was only about a quarter to half mile from my location. I had spent nearly twelve hours driving and was happy to be kicking back with friends and carrying on good conversation. He was about to travel and had a long day ahead of him the next morrow and I was exhausted from the buzzing vibration that accompanies an all-day drive, so soon after the sun set I let my head rest upon a pillow and drifted off to sleep. At the eastern base of Ebbetts Pass, looking westbound on S.H. 4. Notice the steep grade! On my last morning in Santa Rosa, I was able to spend another quiet morning with my parents before I headed out on the road, making my way back to Colorado. A buddy of mine in Crested Butte hooked me up with his Dad’s bagel shop in Sonoma, California, so I took S.H. 12 to that town for a nice visit. The shop is in a strip mall, but in California even the strip malls are done with taste and class, plenty of shade and greenery. I continued on my way, following S.H. 12 to Napa, where I took a scenic detour on S.H. 121 to S.H. 128 and thence to Davis. I had never had a reason to take this route and it was all new to me. Narrow and twisting, these roads were scenic and quiet. From Davis I took the freeways to and through Sacramento. I then took S.H. 16 to S.H. 49 to Angels Camp, where I made my way east on S.H. 4. This was all new to me, and I enjoyed the low hills of the gold country. Once past Bear Valley, the highway narrowed for the journey up and over Ebbetts Pass in the Sierra Nevadas. I ended up stopping shy of the pass so I could camp at Pacific Creek for the night. Once there, and camp was all set up, I took a short hike up along Pacific Creek to the confluence with Marshall Canyon. Although not in the wilderness and evidence of past logging activity evident along with current cattle operations, this area was beautiful. 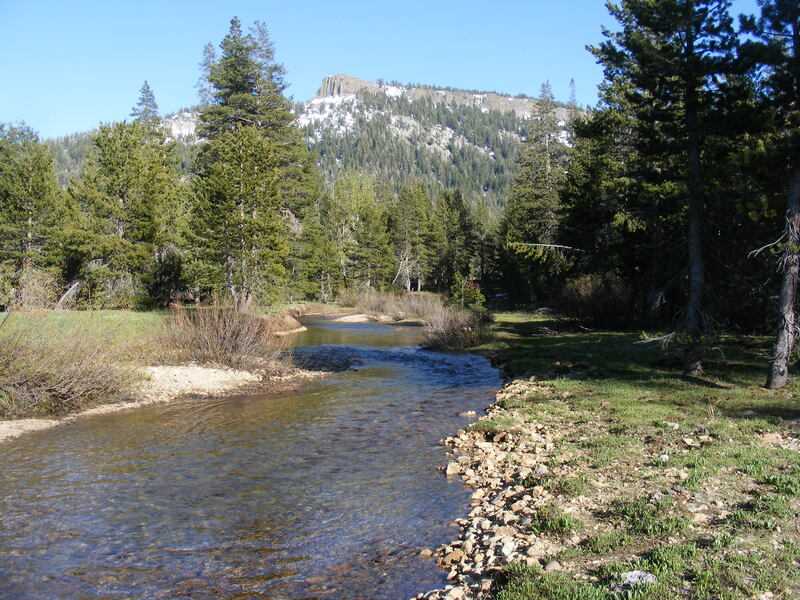 I would like to explore the Sierras more, and the grandeur found here will give me emphasis to do so. I especially enjoyed the shooting star flowers found in the meadow along Pacific Creek. After my short hike I returned to camp and made a small cooking fire. I grilled a steak and some vegetables as the sun set over the Sierras. I cracked open a large beer and sat down to relax, the gurgling creek nearby. It was a near idyllic setting, with some tall ridges and summits nearby. There were snowy, white cornices clinging to the less exposed rock contrasting with the sky, which was a deep blue. The valley was as green as could be and exuded that freshness that comes with new growth. As dusk settled down on the little valley, all was peace. I warmed myself next to the coals from the fire and as they faded away so did I. I soaked the fire in water and gave it a good stir to make sure it was out. Then, off to bed in my tent, content under the conifers, their scent reminding me that I was back in the mountains. After the previous day’s travelling and visiting, I slept in this morning. My dad was especially happy to have me in the house because it meant that he was justified to have coffee, since that is my preferred morning beverage, and once the pot was made he might as well indulge as well. It was Sunday, so we had the big paper to read over and discuss while having Finish pancake breakfast. The stupendous weather continued, not too hot nor cool. While growing up in Santa Rosa and Sonoma County, I had never been particularly interested in the natural world. 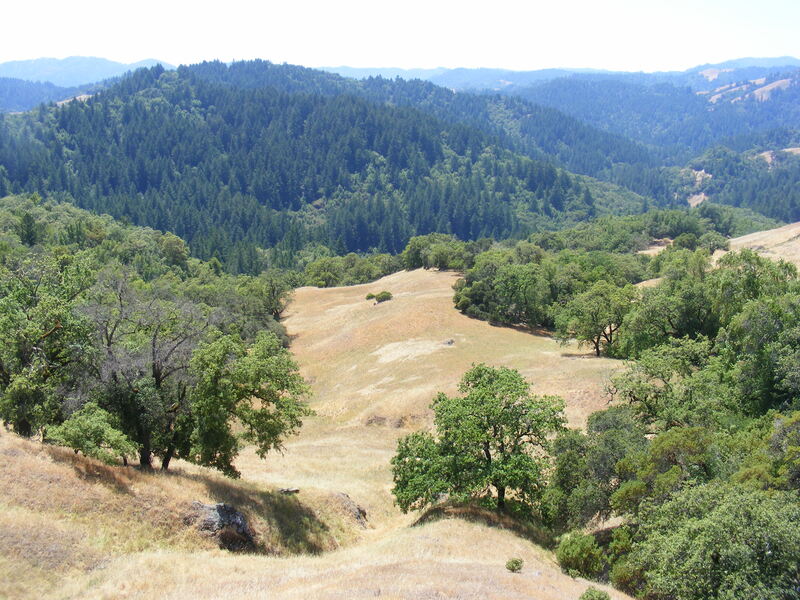 Now, years later, I was much more interested and decided to go out to Armstrong Redwoods State Natural Reserve and Austin Creek State Recreational Area to experience some of the remaining natural habitat in the Coast Ranges. I got to Guerneville just before a large Gay Pride parade was supposed to begin and the area was very busy, even by this resort town’s standards. I was tempted to watch, but there was still some time before the event was to start and I felt more in need of a long hike than sitting around. Yet, the atmosphere was very festive and the crowd genial. I believe everyone had a fantastic time. The hike turned out great. I was struck by how rugged the Coast Ranges are, although they don’t have any large peaks. I also enjoyed the varied ecosystems to be found on the hike, from open oak savanna to dense scrub brush and towering Douglas firs and redwoods. Starting at the Visitor Center, I followed the East Ridge Trail for three miles to the Gilliam Creek Trailhead. I then followed the Gilliam Creek Trail two miles to a short connector that leads to the East Austin Creek Fire Road, which I then followed back to the Pool Ridge Trailhead. The fire road was on a southern exposure and in the direct sunlight. I was warm by the time I had made the climb back up from Schoolhouse Creek. I took a break and drank some water, looking out over the numerous ridge lines that marched off one after the other. I then followed the Pool Ridge Trail to the Armstrong Tree and from there I hiked back to the Visitor Center. There were many wildflowers in bloom and most of them I didn’t recognize although there were a few that are closely related to what I see in the Rocky Mountains. Upon returning to Santa Rosa, I spent a relaxed evening with my parents, having a drink and talking with my dad. The evening faded into night and we watched a mystery or two on the television before I headed off to bed, sleepy and tired from the day’s exertion. I thoroughly enjoyed my hike and am looking forward to doing some more hiking and exploring in my old stomping grounds. Genus Brodiaea or something else? Look at the diameter of this log! Today was a family day for me. I spent early morning with my parents in Santa Rosa and then we three drove down to Sunnyvale to visit my brother and his family. As usual, I was awed by the Golden Gate Bridge and the entrance to San Francisco. I didn’t have time to spend in The City which was a shame as I always enjoy visiting and seeing the sites. We took 19th Avenue, my folks preferred route, although I usually take 25th Avenue these days just for the change of scenery. Or, similarly, I just follow U.S. 101 on Lombard and Van Ness, for no other reason than to see The City. Once near Sunnyvale, we stopped to pick up Dim Sum to take out. We had a nice lunch with my brother, sister-in-law and two nieces. Afterwards, my sister-in-law’s parents visited and we had a fantastic birthday party and cook out for the younger of my two nieces. There was cake for the children and home brew for the adults. How excellent! As the youngsters got sleepy, my folks and I bid our farewell and drove over to visit my aunt and uncle who live just south of San Francisco. We had a nice talk, but it was over much too soon before we had to drive back to Santa Rosa. It was a long day but what a great visit I had with everyone. The weather was very pleasant, just right in temperature and just the slightest of breezes. I do love California but it seems so busy to me. Well, you can’t blame anyone for living there as the Mediterranean-type climate is exceptionally nice.